Zoom Search Engine is a software package that allows you to create a powerful custom search engine for your website. It is unlike other search solutions in that it gives you full control over its indexing capabilities, and there is no advertising or annual fees, while being one of the easiest to use and most feature packed solutions on the market. More on the advantages of using Zoom here. 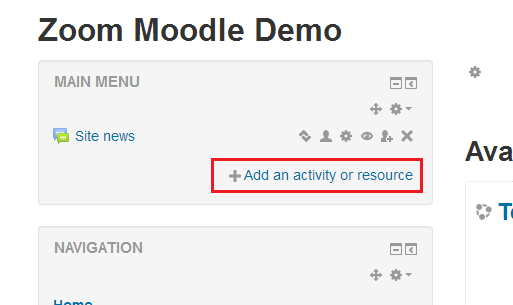 Another key benefit in using Zoom on your Moodle site is that it can be hosted and indexed within an intranet. Other search services like Google Syndicated Search are remotely hosted, and require your website to be publicly accessible over the Internet. Searches will also need to occur with full Internet access, and you will have no control as to how often the index is updated or what pages should be included or excluded from the indexing. With Zoom, you can run and schedule the indexing yourself on any Windows computer on the network. The following article explains how to use Zoom with your Moodle website. We provide this tutorial to explain some common details and steps to get a working Zoom Search Engine up and running, and integrated with your Moodle web site as quickly as possible. Using Zoom on a Moodle website is much the same as using it on any other website, so you will find much more detailed information on installing and running Zoom in the Users Guide (free PDF download). We recommend referring to the Users Guide for most instructions and taking note of the following tips for guidance/reference for Moodle specific details. But to summarize, Zoom has two main parts. The Indexer software which runs on your desktop computer, scans your website and generates a set of "index files". These files are then uploaded to your website and provide the searching functionality. You will also be using the Indexer to update your search engine when you make changes to your website in the future. 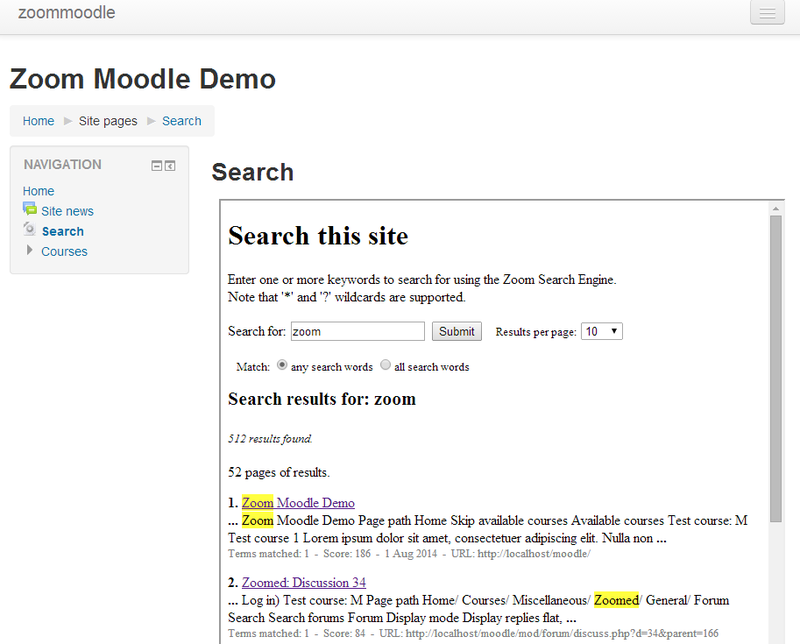 For a Moodle website, you should use "Spider Mode" in Zoom, which allows it to crawl your live Moodle website. You should specify the URL to your website (eg. "http://www.mysite.com/") as your Start Spider URL. One important thing to be aware of when indexing a Moodle site, is that dynamically generated sites, especially complex CMS systems like Moodle (and other forum software, photo galleries, etc.) are generally not particularly Search Engine Friendly. Some of these issues are discussed here, which cover general issues with indexing message boards, etc. As you will notice, the default search page is fairly blank, as it has not yet been customized to suit the look and feel of your website. In addition to this, we would want to integrate the search page within your Moodle site, and we will explain this below. At this point, you should have a working search page which you can access and perform search queries on as seen above. You can use your search page just as it is, and simply modify the "search_template.html" file to match the look of your site. However, if you want to further integrate the search page inside your Moodle website (so that it will maintain the same skinning and various modules you are using), then read on. The simplest option is to add an item in your menu which links to your new search page. For example, with editing turned on, under the "Main Menu" select "Add an activity or resource" and click on "URL". 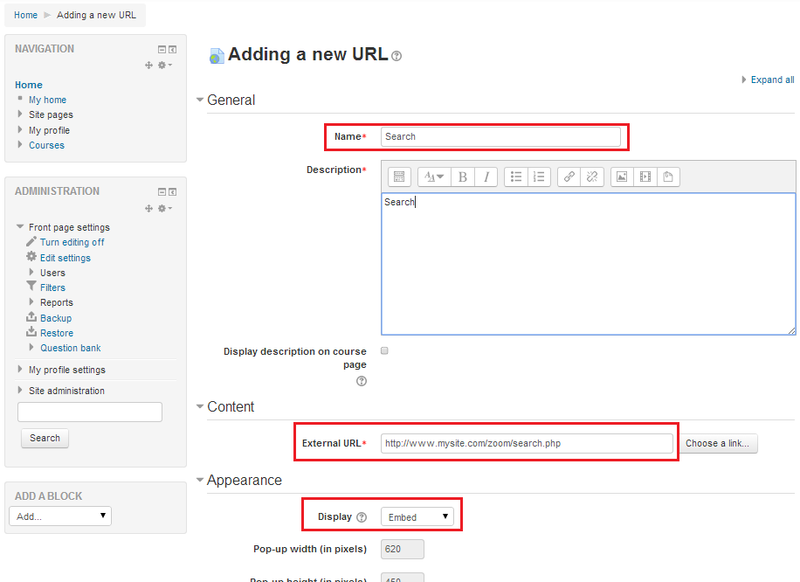 On the "Adding a new URL" page, you can specify a name and description for the link (eg. "Search") and the location for the "External URL" box. Here you should specify the URL to the working search page that you setup earlier (eg. "http://www.mysite.com/zoom/search.php"). From the Appearance box underneath, change the "Display" option to "Embed" This will make Moodle embed on the search page containing your web site's navigation as seen below. You will be able to customize the colours, fonts and overall look of the search page and search results by modifying the "search_template.html" page. Please see chapter 6 of the Users Guide ("How do I customize the look of my search page?") for more information. Note: You may notice that when you click on a search result, the link opens within the frame of the search page (and the top navigation frame remains in place). If you wish to change this behaviour, go to the Zoom Configuration window, and select the "Search Page" tab. Under "Results linking", change the selected option to "Frame or window:" and enter "_top" (without the quote characters, but note that the underscore is important) in the text box next to this option. Re-index your website and upload the files for this change to take effect. You will now find your search result links will open without the top frame. This new HTML block will be created on the page with a title "(new HTML block)". You can then click on the "Configuration" icon to edit this block. You should specify a Block Title ("Search this site") and before entering the following in the Content box, make sure to click the "Toggle HTML Source" button ("<>") before copy and pasting the following HTML. You can then Save your changes. You will need to replace the URL in the above HTML (in bold) with the actual URL to the new search page that you created earlier. Note again that you may want to modify your "search_template.html" file to make your search page match the look and feel of the rest of your Moodle site. Now you have your very own custom search engine as part of your Moodle web site! I hope the above has been helpful in getting you up and running. There are many options and configurations possible with Zoom which you can fine-tune to your heart's content, including highlighting, categories, and more. Please download a copy of the Users Guide for more information.